The aim of 'Project Shark' is to highlight the global issues facing sharks, with a Maldivian focus, as well as enjoying some of the most exciting dive sites the southern atolls have to offer. Project Shark in the Southern Maldives also includes a special focus on manta rays as they are a highlight of this destination and closely related to sharks. 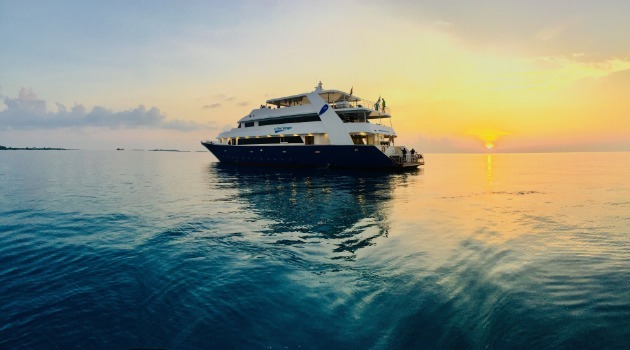 This exciting trip cruises between Malé and the far south of the Maldives - taking in the finest dive areas along the way. The far south offers the opportunity to swim with hundreds of schooling sharks, vast schools of fish and squadrons of eagle rays - on top of this, the incredible hard coral reefs packed with colour and critters. And don't worry - we've found manta and whaleshark points! The far south offers exciting diving for experienced divers with adventure in mind. This is a stunning trip so expect some amazing scenery and varied diving. The week will involve close encounters with sharks, manta rays and whale sharks (although these sightings cannot be guaranteed!) with the possibility to observe them in their natural habitat and donate vital information to local Maldivian marine research organisations. You will be joined on board for the duration of the safari by our experienced blue o two Project Shark trip host, Dr Elke Bojanowski. Project Shark is delivered by our resident marine biologist Dr Elke Bojanowski, who will conduct seminars giving divers the opportunity to gain a better understanding of the biology and behaviour of sharks. There will also be a chance to learn about globally endangered marine species and what as divers we can do to aid their protection. Founder of the 'Red Sea Sharks Trust', experienced dive guide and marine biologist, Elke Bojanowski Ph.D, began the Longimanus Project in October 2004 and since this date she has been actively collecting underwater photographs and video-clips of Oceanic Whitetip Sharks for catalogue, review and analysis. Since 2012 the project has expanded to become Red Sea Sharks (www.redseasharks.org) and increased its scope to include Grey Reef and Silky Shark catalogues and monitoring for many shark species. Project Shark is delivered by our resident marine biologist Dr Elke Bojanowski, who will conduct seminars giving divers the opportunity to gain a better understanding of the biology and behaviour of sharks. There will also be a chance to learn about globally endangered marine species and what as divers we can do to aid their protection.